Celebrity Tomatoes are a 1984 All-America Selections (AAS) award winner. Moreover, Celebrity is a reliable producer. It can grow just about anywhere – in Canada’s short summers, Florida’s heat and humidity, and points in between. Its adaptability to a wide range of conditions make it popular. So does the fact that it’s easy to grow (read: not fussy), productive, and consistent. It’s a solid, all-purpose tomato that can be used fresh or in cooking, canning, juicing, salsa, or for slicing. The biggest controversy about Celebrity among gardeners is its taste, which has been described as “average.” For that reason, some growers use it solely for cooking. 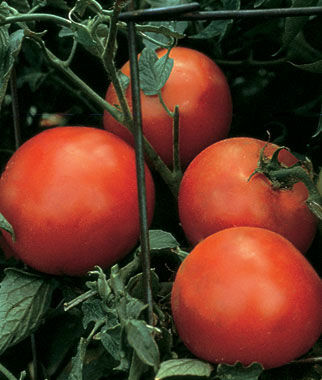 The first commercial hybrid tomatoes were produced in the U.S. in the 1940s. Identities of early tomato hybrids parents, or at least one of them, are often not a secret. As tomato breeding became more sophisticated, lineage became more carefully guarded. It was Colen Wyatt of Petoseed (now a subsidiary of Seminis Seeds) who was responsible for developing this tomato. Wyatt was one of the most successful home garden vegetable plant breeders in the last half of the 20th century. Along with tomatoes, he bred award-winning squash, pumpkins, and cucumbers. Wyatt bred Celebrity, which of course was the 1984 All-America Award winner. But his tomato success didn’t stop there. There was also Husky Gold Tomato, a 1993 All-America Award winner and Big Beef, a 1994 All-America Award winner. Although classified as a determinate, Celebrity often continues to produce tomatoes until frost. Thus it is occasionally labeled as a semi-determinate. Although it is bushy, plants can get to be 10 feet tall or more. Size depends on climate and soil. But don’t prune Celebrities. Provide adequate staking, whether by cages, Florida weave staking, or posts, even in containers, to support the weight of the fruit. Plants can produce 30-40 tomatoes each. While Celebrity is touted to be about 70 days to maturity, in reality many gardeners say the maturity date is closer to 90-100 days, making it a mid-season producer rather than an early one. Other notes: exceptional disease resistance. Uniform ripening – no green shoulders!